What to do if your team struggles late and is unable to sneak into the playoffs after a somewhat surprising season? Change your logo, of coruse. In what appears to be a leak from the usual iron-lockdown world of MLB Properties, it seems that both the Arizona Diamondbacks and Cincinnati Reds are changing versions of their logos next year. The logo message board — yes, such things exist — at SportsLogos.net posted them over the weekend, and they have been confirmed from outside sources. 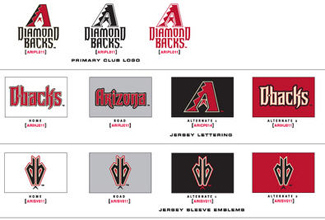 The new logos for the Diamondbacks are more radical, and, all told, we're really not that impressed; the letters seem awfully small. The Reds made a more minor change, mostly with the font on the front of the uniform. We are still waiting for Cubs to switch to pewter, by the way. Hey, can't hurt.